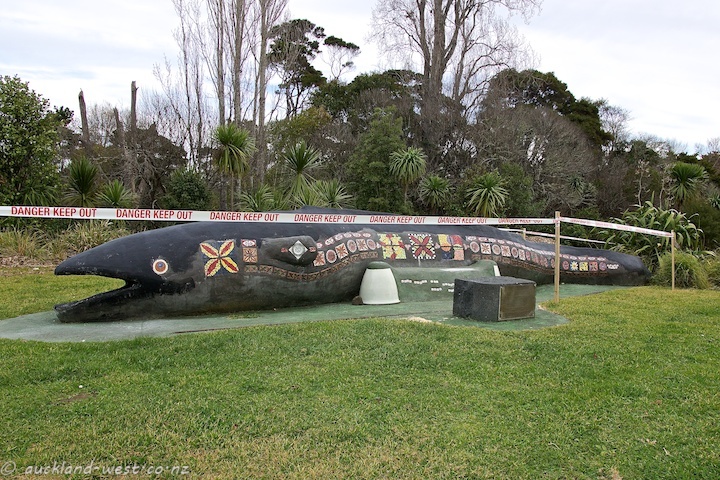 This eel sculpture with its ominous warning lives in the grounds of the Corban Estate Arts Centre in Henderson, next to the Opanuku stream. “Moana the eel sculpture was unveiled to the world on 28th November 2007. Her metal skeleton was first made by local artists Dave McCracken and Al Green some years ago. Project Twin Streams Opanuku Stream, the Pacifica Mamas, Waitakere Pacific Art and Cultural Trust and Waitakere City Council worked with artists Janet Holt, Bruce Courtney, Norbryn Eyre and young people from Henderson High School, Liston College, Mother of Divine Mercy and Beautiful Daughters to create Moana as she now stands. “A corner stone from the original Henderson Town Hall and an old local piece of tramline have also been incorporated.